Mabuda Farm - Siteki Accommodation. 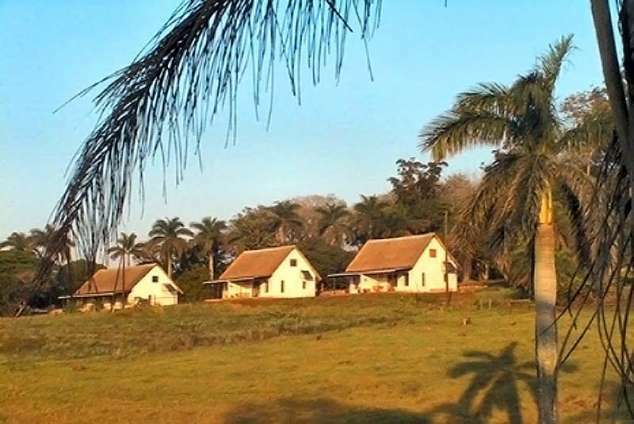 Mabuda or "Place of Dreams" is a romantic corner of the beautiful Lebombo Mountains. This is an historic farm: 1930's decor and atmosphere are evident everywhere you look. The farm produces maize and beef, and with the dairy, the oldest in Swaziland, still provides quality food for the village community. Mabuda, set amongst exceptional natural beauty offers fantastic birding and spectacular views, right on your doorstep. A large pool set in the garden of the historic Mabuda House is available to guests. You are invited to use the Boma's for entertaining and a braai. Farm produce such as creamy milk, fruit, homemade butter and jam is on the breakfast menu! Warm thatched rondavels and chalets provide accommodation for up to 37 visitors in 8 units offering a choice of Self-catering or B&B, backpackers or camping. As they are thatched, we do not encourage smoking indoors. Mabuda is the ideal setting for that special weekend, a few days "away from it all", a place for groups to meet up on the way to Mozambique (border 28Km away) or the Kruger Park. Business travelers will find this a quiet stop-over. We do not provide TV, bar facility or a restaurant. South African rand is accepted but there are no credit facilities at Mabuda. Siteki town is 1km away, hosting restaurants and a variety of shops to meet self catering needs. There is an FNB bank with ATM, a filling station and Off-sales. 21662 page views since 15 Feb, 2008.